Huig de Groot, or Hugo de Groot, who, according to the fashion of the time, took the Latin name of Grotius (1583-1645), was a scholar and statesman of the most diversified talents, and one of the master minds of the age. He was involved in the religious controversy which at that time disturbed Holland, and he advocated the doctrines of Arminius, in common with the great statesman, Barneveldt (van Oldenbarnevelt), whom he supported and defended by his pen and influence. On the execution of Barneveldt, Grotius was condemned to imprisonment for life in the castle of Louvestein; but after nearly two years spent in the prison, his faithful wife planned and effected his escape. She had procured the privilege of sending him a chest of books, which occasionally passed and repassed, closely scrutinized. On one occasion the statesman took the place of the books, and was borne forth from the prison in the chest, which is still in the possession of the descendants of Grotius, in his native city of Delft. The States-General perpetuated the memory of the devoted wife by continuing to give her name to a frigate in the Dutch navy. 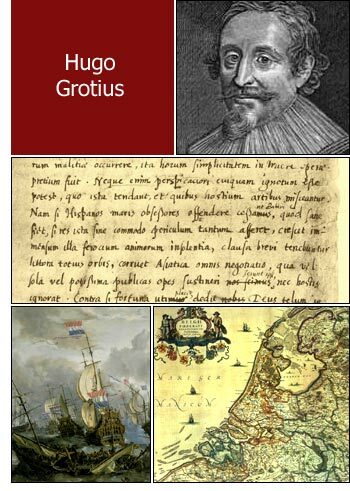 After his escape from prison, Grotius found an asylum in Sweden, from whence he was sent ambassador to France. His countrymen at length repented of having banished the man who was the honor of his native land, and he was recalled; but on his way to Holland he was taken ill and died before he could profit by this tardy act of justice. The writings of Hugo Grotius greatly tended to diffuse an enlightened and liberal manner of thinking in all matters of science. He was a profound theologian, a distinguished scholar, an acute philosopher and jurist, and among the modern Latin poets he holds a high place. The philosophy of jurisprudence has been especially promoted by his great work on natural and national law, which laid the foundation of a new science.